There is no second minimum. This is College Physics Answers with Shaun Dychko. 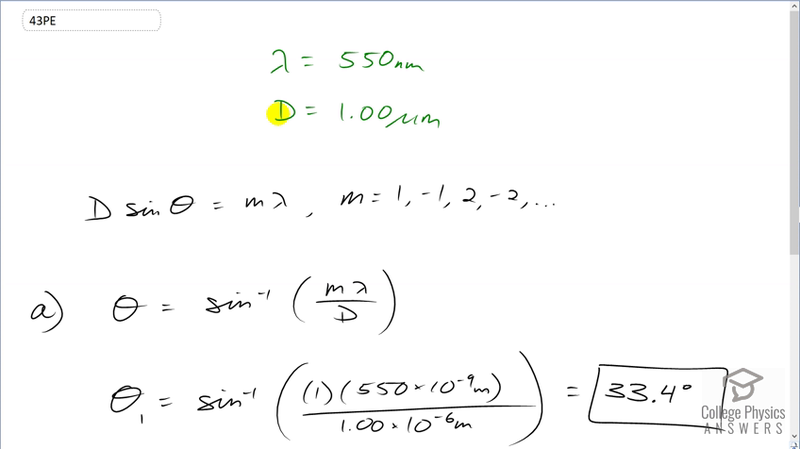 We're going to find the angle to the first minimum in the diffraction pattern for light of wavelength 550 nanometers passing through a single slit of width one micrometer and we'll use this formula to figure it out, where <i>m</i> is the order of the minimum. And it's the first minimum or the second minimum or the first minimum on the other side of the central maximum or the second minimum on the other side of the central maximum. So we're going to solve for theta here then and we'll do that by dividing both sides by capital <i>D</i> and then take the inverse sine of both sides so theta is inverse sine of the order times a wavelength divided by the slit width. So the first minimum is going to be theta one is the inverse sine of one times 550 times ten to the minus nine meters divided by one times ten to the minus six meters giving an angle of 33.4 degrees to the first minimum and defining the second minimum will plug in the number two in place of the letter <i>m</i> because it's the second order minimum and multiplied by the wavelength divided by the slit width and this is undefined because this number here is greater than one and that is beyond the range of the sine function. So the inverse sine has no answer for a number of greater than one. So there is no second minimum, in other words.